The Urban Canada Foto Kollective (UCFK) are photographers who are interested in the cityscape, the ebb and flow of life on the street, and the ways people affect their environment. 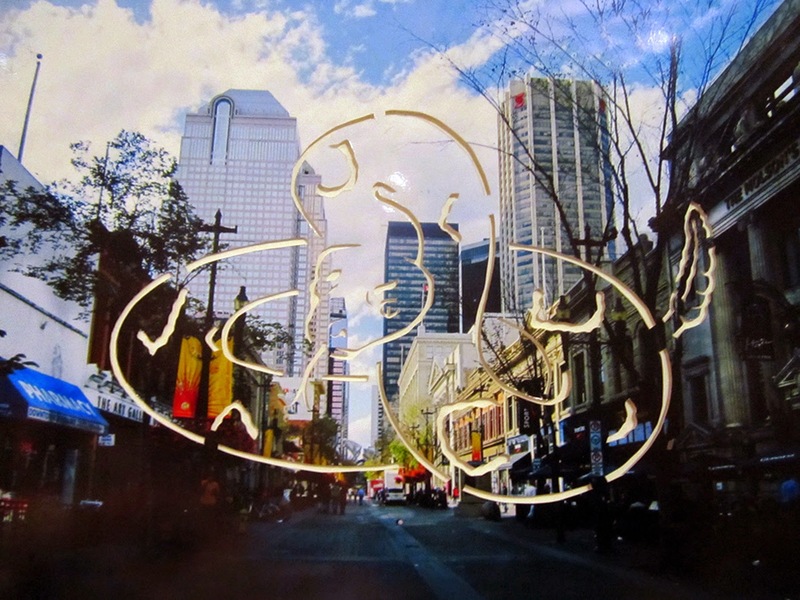 UCFK aims to make photography more present in Calgary, and continue a critical dialogue about image making and urban life. In past exhibitions, UCFK has examined themes dealing with the connections and disconnections of urban living a simultaneous yearning for wild nature amidst vain attempts to civilize it. With Wild Life, UCFK have turned their attention to the animals in our urban environment. Melody Jacobson’s photographs also come from travels to Spain, London and in her new hometown of Vancouver. The subjects in her photos are pensive and watchful, peering at the viewer like the crow on the wire, or the girl in the street scene in Barcelona. The puppy in this photo looks content with her sleeping master, however, the pity on the skateboarding boy’s face speaks volumes to the uneasiness society has with nonconforming behaviours, such as the men sleeping in the street. Her photos also highlight the animal nature of humans, with office workers sitting by the Thames River in London on their lunch hour, by juxtaposing a similar scene with ducks resting by a swimming pool closed for winter. The photos are printed on Canadian birchwood, further merging themes of nature with street photography. Cat Schick’s contribution to this exhibition is different from what she’s done before in that it is more than straight photography. Her pieces are 11x14” color photographs with images of animals cut out of them, combining the street art vernacular of stencil with the medium of photography. The animals chosen are all those who live or have lived on the prairies and are literally cut out of or removed from the city landscape – those that were here before us and have adapted to the urban environment (rattlesnake, bat, hare, bird) and those who have been driven further and further away, only to be challenged and possibly killed when venturing back into the city (cougar, moose, deer). The buffalo has not been seen on the prairies for many decades and is slowly being reintroduced back into national parks in some provinces. The work aims to question our relationship to animals and our ability to share the environment with other beings. As a collective of female photographers observing our urban environment, UCFK consciously creates images to remind us of the subtle power of nature. The images examine the durability and fragility of these moments, when the city noise quiets and we’re struck by the beauty of an image of nature: where we came from and where we’re going all in the same moment.